Lock in a great price for I Grappoli – rated 8 by recent guests! The swimming pool and surrounding area are excellent, the photos on the website didn’t do it justice. The location and scenery are stunning. The courtyard bar area is very pretty. We enjoyed the games room with the table tennis. The staff were really friendly and spoke excellent English. There are lots of places to visit nearby - Lake Lugano and Lake Maggiore are both beautiful. Easy access to Italy too. A really nice location on a hill with a big swimming pool. 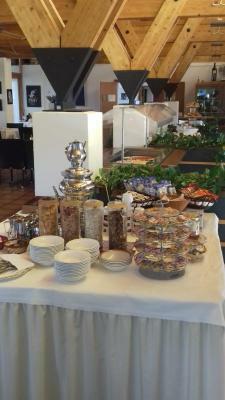 We also enjoyed the restaurant and the relaxed atmosphere. This place attracts mostly families with younger children and has enough space for the kids to play around while the parents have dinner. The staff was also very friendly and forthcoming. we enjoed our short stay in the hotel very much. The staff is very good and friendly, the restaurant service was also nice and the dinner is really delicious. Every evening there was a program either for adults or kids. The view from the hotel is very picturesque. 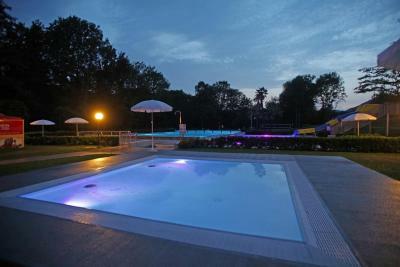 Very nice location, great swimmingpool. The rooms where very clean. Nice restaurant with great vieuw and nice, fresh meals. Good and quiet location, easy to relax, available parking, very kind and helpfull staff, super balcony in the room, clean and comfortable place. Le personnel était très accueillant et sympathique. Toujours prêt à aider. Wir hatten ein Zimmer mit Balkon. Es war sehr ruhig. Dazu ist zu bemerken, dass wir am Saisonanfang dort waren. Das Bett war super bequem. Die Bedienung im Restaurant sehr freundlich und das Essen hervorragend. Sehr zu empfehlen. Ruhige Lage, kein Verkehrslärm Personal sehr angenehm. La grandeur et le confort de la chambre. La tranquillité des lieux et la beauté du site. La serviabilité du personnel et l’excellance des mets préparés par l’equipe de cuisine. I Grappoli This rating is a reflection of how the property compares to the industry standard when it comes to price, facilities and services available. It's based on a self-evaluation by the property. Use this rating to help choose your stay! Located in Sessa, I Grappoli features a seasonal outdoor swimming pool (25 x 50 feet), garden, terrace, and free WiFi throughout the property. This 3-star hotel offers a shared lounge. The hotel features a local restaurant. At the hotel, rooms are fitted with a wardrobe. 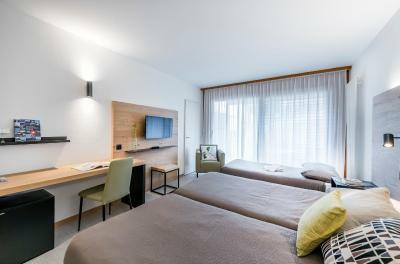 Rooms are complete with a private bathroom equipped with a shower, while certain units at I Grappoli also feature a seating area. 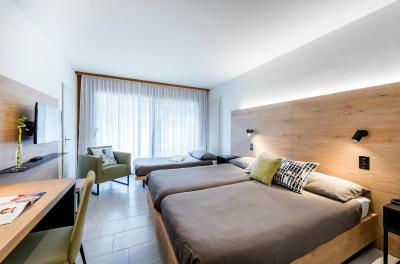 Guest rooms in the accommodations are fitted with a flat-screen TV and a hair dryer. You can play table tennis and billiards at I Grappoli. Lugano is 12 mi from the hotel. 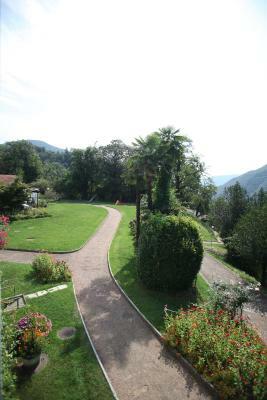 The nearest airport is Lugano Airport, 3.7 mi from the property. When would you like to stay at I Grappoli? Room with a balcony, satellite TV, a refrigerator, a safe, and a bathroom with a hairdryer. This family room has a balcony. This bungalow has a patio, kitchenware and barbecue. House Rules I Grappoli takes special requests – add in the next step! Other I Grappoli accepts these cards and reserves the right to temporarily hold an amount prior to arrival. I Grappoli accepts these cards and reserves the right to temporarily hold an amount prior to arrival. Please note that the restaurant and the snack bar are open from 17 March until 28 October. 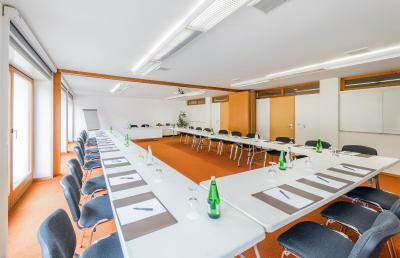 On request, the hotel can organize a bus transfer either from/to Sessa Bus Stop or Ponte Tresa Train Station for a small fee.Please note the following information for the period from November to March: - The reception is open from 08:30 to 18:00 Monday to Friday. If you arrive after 18:00, you will find your key in a key box next to the entrance door, along with an information sheet. 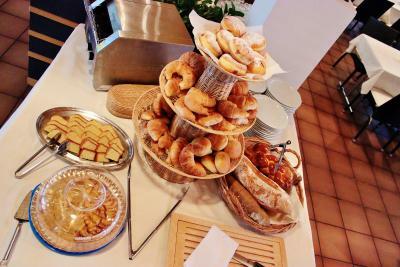 - Check-out is possible from 08:30, and breakfast is available from 08:30 to 10:00. On Saturdays and Sundays, the reception is open at irregular hours. Guests arriving on a weekend will be contacted directly with further information. Please note that the city tax includes the Ticino Ticket. It offers free benefits and discounts in the Canton of Ticino, including free use of train and bus services. For more details, please contact the property directly. The bungalow was a little dark, more windows would have been good. It was described as a garden view, but we couldn’t see any garden! There was a very small private sitting area outside with a view of a wall and a few trees. The location is nice but somewhat remote, so if you want to have dinner some place else, it helps to have a car to get around. Front desk and restaurant/bar staff seemed overwhelmed and somewhat underqualified, especially regarding language skills. Only Italian or maybe French? No German, not even English?? The hotel is advertised as being quiet - but it was nowhere mentioned that there is a nearby facility for school classes/boyscouts and the like with the associated hustle and bustle. Should be mentioned. The same goes for the fact that when weddings or other large events are hosted with live music (outside or at least decently audible). This is not what I expect when reading "quiet". As others have mentioned: breakfast is indeed mediocre.